I haven’t seen a ton of silent pictures but more than the average film goer. People in the Bay Area are blessed by having an old movie house — The Stanford Theatre — which is the only place in the vicinity that shows silents accompanied by a live Wurlitzer player. Back in February, I had the fortune to screen Seventh Heaven and it just so happened to be my first silent witnessed under those conditions. Simply put, seeing the 1927 Best Picture winner ranks among my finest motion picture viewings. There are certain movies you see — Jaws, Apocalypse Now, and Mulholland Dr. come to mind — where you are stunned by the time you vacate the theatre. Borzage’s spectacular love story impacted me to that extreme. I was somewhat skeptical on the way to The Stanford. Katie is always pimping out Borzage’s work and Seventh Heaven is one of her favorites. Having seen A Farewell to Arms, Man’s Castle, and Liliom I was somewhat underwhelmed. Especially in the case of the latter in which Charles Farrell was a stiff. Fortunately, he was working in the presence of a great actress in this film. Janet Gaynor’s portrayal of Diane is one for the ages and it earned her an Oscar. She plays a street urchin/prostitute in Paris during the days immediately preceding WWI. Chico (Farrell) is a sewer worker. Macho and full of braggadocio, the blue-collar laborer also hides a big heart. Diane and her sister Nana struggle under squalid living conditions. The older woman also harbors an addiction to absinthe. Gaynor’s character is timid and soft spoken. Nana sadistically preys on her pliancy by beating her sister 24/7. One day the sisters’ wealthy uncle and his wife come to rescue the girls provided they have not dishonored themselves in some unsavory way. In a pivotal moment, Diane cannot betray her honest nature and she confesses to having prostituted herself. A golden opportunity lost, Nana gives Gaynor’s waif her most vicious whipping yet on the street and if not for the gallant Chico’s intervention, probably Diane’s last. Farrell’s good samaritan takes the young woman back to his attic apartment. This is one of the film’s best shots as the two are shown ascending seven flights of stairs from a sideways perspective. 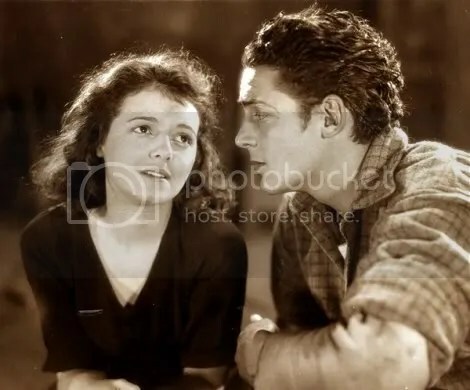 As Chico is fond of saying, “I may work in the sewer but I live among the stars!” Borzage does a beautiful job of slowly showing this man and woman fall in love. Diane eventually breaks through the gruff exterior of her savior and he proposes marriage. I’m a big fan of facial close-ups, especially on females. There are several moments during Seventh Heaven where Gaynor’s expression had my waterworks flowing: the first time Chico says he loves her, the look of unfettered bliss during the marriage ceremony, and the scene when the woman’s husband returns from battle are all priceless. Borzage does two things to really show how the couple’s sum is greater than its parts. Subtle lighting and skillful musical timing project the idea that Chico and Diane’s union is a metaphysical one. A relationship that can transcend any economic hardship, war, or physical malady. Married at exactly 11:00am, they make a pact to always think of the other when a clock strikes that hour. Even apart the two can feel their spouse’s presence at that time of the morning. A recurring title card througout the picture reads: “Chico—Diane—Heaven!” I can’t improve upon that. I saw Vidor’s The Crowd — often said to be the second best silent behind Murnau’s Sunrise — not two weeks later and wasn’t nearly as impressed as I was by Borzage’s simple Parisian tale of romance. Seeing Seventh Heaven at The Stanford was not only one of my favorite film going experiences ever but nights out in general. The Rotten Tomatoes forums are going to be down for about a week for a systems upgrade, so I’m going to spending a little more time a the TCM forums, and I thought it might be a fun thing for the Obscure Classics gang and our readers to do. Join up at TCM, post at the forums together. They’ve also got this new Film Union thing where you can friend each other and become fans of stars and movies. It’s kind of neat, and I think it would be fun if we all did that together. Odd that Stanwyck’s character in this 1946 weeper is named exactly the same as she was in Forty Guns. When I first read the synopsis of this film, I rolled my eyes. Soap opera city. Imagine my surprise when by the denouement of the picture, I was moved to tears. That’s how effective Babs is in conveying her pain @ being split between the love for her boys and personal happiness. I have friends who grew up in the North Shore area and their anecdotal stuff about the blue bloods and their snobbish behavior combined w/ gossip is plentiful. So the Chicago stuff for that decade is spot on. Jessica Drummond is in the untenable position of being a widow who is expected by her mother to honor a dead husband’s memory by not pursuing any other relationships. Brutal expectations and Stanwyck shows us that they are inhuman standards. James and I are planning a new feature in which we have a weekly discussion/debate through email and then post it here at the end of the week. We’re looking for topics for these discussions, so we’d love to hear from you guys. Eternally Yours was one of my favorite movies when I was a kid, and it was one of the first classic movies that I really, really loved. It had been about 10 years since I’d last seen it, despite the fact that I’ve owned it on DVD for several years now (it came with The Greeks Had a Word for Them). So yesterday I decided to pop it into the DVD player. And then I proceeded to ruin my childhood memories. Anita (Young) is getting ready to marry Don (Crawford) when she meets charming and committed magician Tony (Niven). The two fall in love and marry. Anita goes on the road with Tony’s act, even performing in his show with him. But his stunts become more and more dangerous to please his devoted crowd, and Anita can no longer take it. She divorces him, and to get over the heartache, she marries Don. But of course Anita can’t escape Tony for long, and not long after her wedding they’re stuck at the same party together. The film has a wonderful supporting cast in C. Aubrey Smith, Eve Arden, Bille Burke, and Zasu Pitts, but they are all under-utilized. Arden, Smith, and Burke seem to disappear half-way through the film, which adds to the feeling that there are two very different types of films going on. Yes, there is a huge tonal/content shift halfway through the movie once Anita and Tony are divorced that is jarring. The first half is actually very charming, and is easily the best part of the movie. Niven and Young have good chemistry, and the story of a daring magician who’s torn between his commitment to his fans and his commitment to his wife makes for a very interesting love story. Had this simple premise been pulled out a little more, it would have made for a very charming romance. But then it shifts halfway through to become a remarriage comedy. Which is a big mistake, because the best remarriage comedies are the ones that build the premise of the remarriage from very early in the film. (There are exceptions to this of course, like Sturges’ The Lady Eve.) This remarriage comedy falls flat on its face because it’s given very little time to breathe or develop. This whole aspect of the film feels very rushed. Overall, it’s not a bad movie, and perhaps if I hadn’t loved it so much when I was young I may have enjoyed it a little more this time around. But as it is, I feel like I just destroyed a very important part of my childhood film experience. …though I did catch something. Which is part of the reason I’ve been gone for so damn long. I was away for several days on a trip to New York. And while I didn’t catch Swine Flu, I did catch a flu, so I wasn’t up to doing much for the week after I got back. Then I spent a week covering at work for a woman who went on vacation. So I’ve had very little time since I’ve been back to do anything. But, I am back now, and I want to thank James for staying on top of things while I was away, and for continuing to update so that the page didn’t look dead. 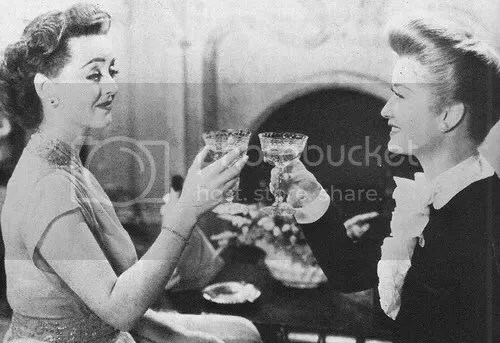 Another women’s weeper pairing two combustible participants: Bette Davis (Kit Marlowe) and Hopkins (Millie). These women are friends but rivals. When Kit publishes a big Broadway hit of a play, she becomes famous in Manhattan circles. Not to be outdone, Millie begins to write trashy romances and they ironically are gobbled up by the reading public. Despite being a hack, Millie has a great deal more financial success than her “friend” who is a respected artist. Hopkin’s character’s obsession with writing alienates her husband Preston — played by John Loder — and he sours on their union. When he confesses to Kit that he really loves her, she rejects him. However, Preston divorces Millie anyway. MH portrays a female type that I am very familiar with having dated several of them over the years. Bergman calls them pathological narcissists and numerous pictures he’s completed cast this kind of woman in prominent roles. Millie’s focus on life is so myopic that she selfishly concocts plans that are indifferent to the people around her. She expects everyone to incorporate her life design as their own. To not get onboard is to carve a miserable existense for yourself, at least if you don’t break free from such a woman. Needless to say, by the picture’s end the romance novelist has alienated everyone around her. Except oddly, not Kit. Though she has been the picture of propriety throughout this story, Kit has somehow managed to push away any amorous entanglements that might be permanent. When a handsome man 10 years younger proposes marriage to Kit, she rebuffs him. 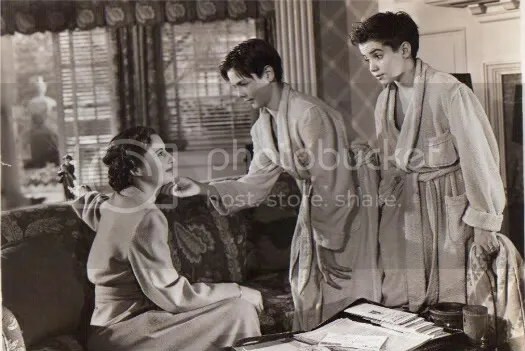 In the famous Davis/Hopkins moment Kit becomes irate that Millie is oblivious to how good her life has been, culminating in the former shaking the snot out of the latter. Art imitating life? Still, we see them toasting to a New Year in the final shot implying that the two writers are all they have. Sorority sisters if you will. Old Acquaintance is a good film and I really responded to the female archetype played by Hopkins. She’s such a nasty person on the screen that I can’t help but love MH’s performance.